Description: How low would you go to win a million dollars? Just how desperate are you for the cash? Desperate enough to enter the Red Room? 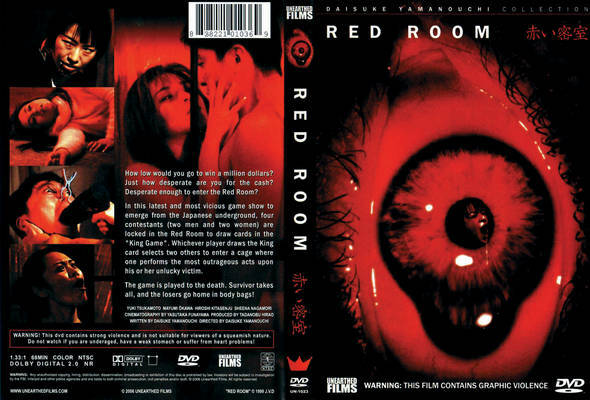 In this latest and most vicious game show to emerge from the Japanese underground, four contestants (a husband and wife on the edge of divorce, and two sisters) are locked in the Red Room to draw cards in the “king game.” Whoever draws the king selects two others to enter a cage where one performs the most outrageous acts upon his or her unlucky victim. The game is played to the death. Survivor takes all, and the losers go home in body bags!